The Maldives is renowned for it’s incredible resorts – with postcard perfect beaches, overwater bungalows and indulgent escapes. 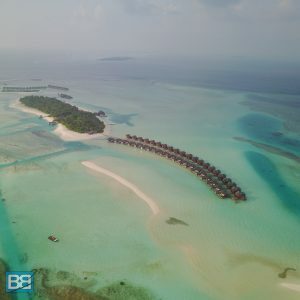 And having explored the Maldives on a budget I also decided to sample what a luxury Maldives escape had to offer and headed to Anantara Dhigu. Situated just a 35 minutes speedboat transfer from Male Airport in the Kaafu Atoll the stunning resort of Anantara is everything you’d expect from a 5* island resort in the Maldives – with sun, sand and good times all round! Anantara is actually comprised of 3 island within the same lagoon – Anantara Dhigu, Anantara Veli and Naladhu Private Island. Anantara Dhigu – Island Paradise! I stayed at Anantara Dhigu – which the family or younger couples island in one of the Beachfront Villas. With a huge bed and a sandy path that lead straight down to the ocean it was a stunning area to unwind and fall asleep to the sound of the ocean – although admittedly I didn’t spend much time in there as I was out enjoying the sunshine and ocean! The room came kitted out with all the amenities you’d expect from a resort of this calibre – A/C, mini bar, coffee machine, TV and in-house dining if you required it. Honestly through the bathroom of the room was even more of a draw than the room – and about the same size! There was a huge outdoor bath (more than big enough for two people to chill out with a bottle of champagne…not that that happened at all!) and an outdoor waterfall shower too where you could rinse off after a dip in the ocean beneath the palm trees listening to the local birds. 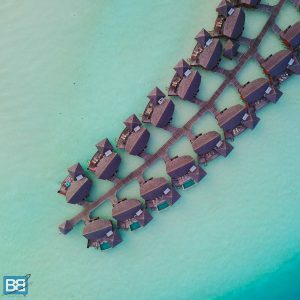 And of course if you wanted to upgrade your stay you could splash out and go for the overwater bungalow options – which sit at the end of the island overlooking the lagoon, with school of fish and baby sharks cruising just below your balcony – perfectly cliched but beautiful! 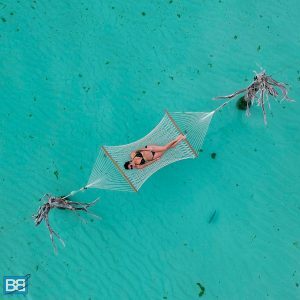 The Ocean Hammock Is A Must! As with pretty much every Maldives resort Anantara is all about the ocean – with huge stretches of beach to relax and top you tan up on alongside a variety of ocean based activities too. Grab a kayaking (there’s a couple off totally clear, glass ones which you should try at least once!) snorkel or stand up paddle board and explore the lagoon which is teeming with fish, rays and some baby sharks too. For those who want to get really amongst the marine life Anantara has an in house dive centre (Aquafanatics Dive Centre) which caters for all levels of diver. Whether you’re looking to give scuba diving a try for the first time or you’re an experienced diver there are plenty of dive sites around the resort to keep you busy. Drift dives amongst huge schools of fish being hunted be trevally to coral bombies teeming with macro lift. Or if you’d prefer a little bit more adrenaline with your salt water why not hit the waves and go surfing? Anantara is one of the Maldives bases for Tropic Surf and their team of salt water gurus will happily get you up and riding at the resorts private surf break! Again – from beginners to advanced – no matter what your level of surfing this break will leave you with a huge smile on your face and rides you’ll be chatting about over beers into the night. The fact that Anantara is made of of 3 islands makes dinning out here and experience in itself and with 6 restaurants to choose from you’re pretty covered – from Italian to Japanese! Quick word of warning though – you’ll need to pre book a table at least 24 hours in advance to avoid having to eat super late or choose another place to dine! My favourite part of this setup though is the fact you’ll need to get one of the inter island boats to your restaurant – cruising through the lagoon at night is pretty beautiful and the lights underneath them attract lots of marine life – so keep and eye out for hunting stingrays and sharks en route to your meal! There are also two main bars within the islands – the Aqua bar caters for all guests and is great for a place to grab a cold beer during the day, but if you’re looking for something a bit more chilled and classy the Dhoni is an adults only area and ideal for a sunset drink. Both have stunning ocean views, amazing cocktails and chilled vibes – plus some really tasty bar snacks too! The Perfect Place To Indulge! And of course if you’re on holiday the chances are your gain to want to indulge yourself – you are on island time after all! So make sure you pay a visit to the beautiful overwater spa that Dhigu has to offer. Their massage rooms even have glass panels in the floor so you can watch the fish swim below you as you get your back massage! Or if you fancy something a bit more al fresco how about a treatment in the outdoor area – where the sound and breeze of the ocean will kickstart your relaxation. As you might expect there are a variety of treatments to choose from so whether you want a manicure or a couples massage there’s more than a few excuses to treat yourself. 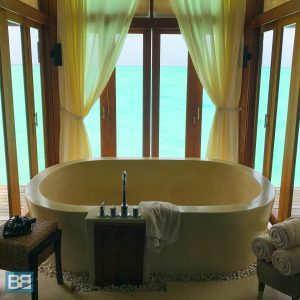 Why Not Splash Out On An Overwater Bungalow? So how much will all the luxury set you back? 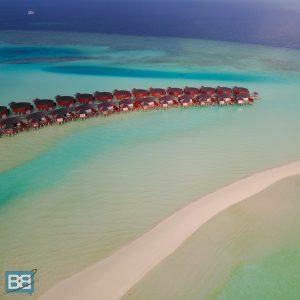 Well Anantara is one of the more high end Maldives resorts and a double Beach Bungalow starts at around $515 per night. Or for those looking to splash and tick and overwater bungalow off your bucket list expect to pay around $1035 per night for the pleasure. With this price tag comes all the little extras that are going to make your stay in the Maldives even more special – from an A/C lounge in Male Airport (seriously, you’re going to appreciated that!) to cold towels on the transfer boat and staff who will remember your name within hours of arrival. …they’ll even wave you off as you say goodbye! So if you’ve got 48 hours in The Maldives or a week it’s the perfect taste of Maldivian luxury. And if you really want to go ALL out you could stay at the Naladhu Private Island which is the most luxurious option of the 3 – but this will set you back $1500 a night min, but your room will come with its own private butler and you could well be rubbing shoulders with celebs like Cristiano Ronaldo who often holiday there! Check out the latest rates and availability for all 3 here. Have you stayed at Anantara Maldives? How did you rate it? What was your preferred mode of transportation? Glass Bottom kayaks or paddle boarding? Every time I see pictures of Maldives I want to stop what I’m doing and just fly over! I’m going to say the glass kayak was my favourite! Iv’e always wanted to Try a Glass bottom kayak just to see how it is! Just the fact that you can see fish swimming underneath is amazing enough in it’s own right! hahaha yeah they’re pretty awesome hey! ?